Yeah! 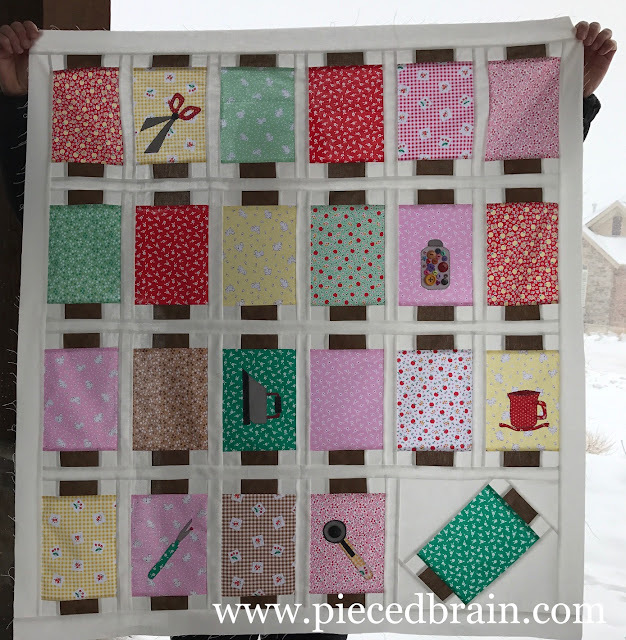 I put together the quilt top for my Spools quilt! I have yet to quilt it but I wanted to show you how cool the blocks look stitched together. The quilt measures 38-3/4" x 42-1/4" and the blocks finish at 5" x 9". I followed the spool instructions from Peta Peace's book A Piece of Cake - Sweet and Simple Quilts from Layer Cake Squares published by Martingale. 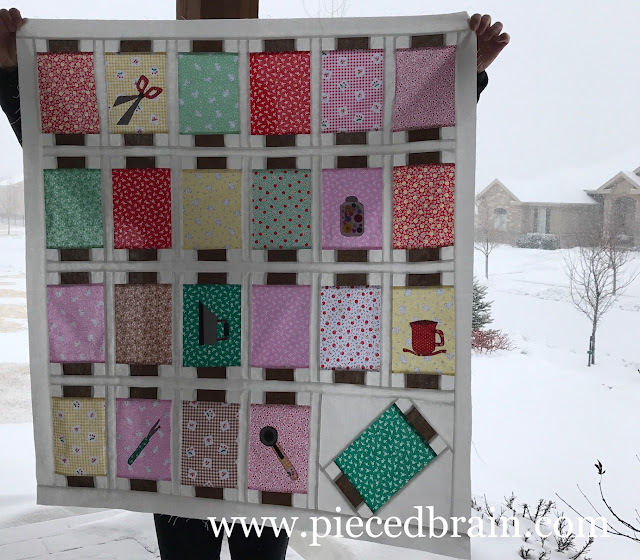 All the fabrics are by Riley Blake Designs - the fabric line is called Apple Farm by Penny Rose Fabrics. I am glad I chose these fabrics! 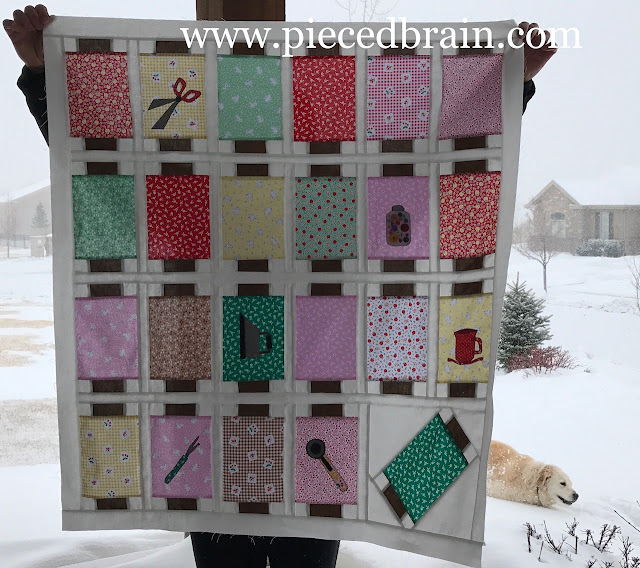 The sewing notions I machine applique' on some of the blocks was a cool addition to this project. The iron, seam ripper, rotary cutter, scissors, and button jar were taken from the book Needle and Notions book also published by Martingale. I can't wait to quilt it. I have the perfect fabric by Riley Blake also for the backing. However, on this snowy day, I am writing patterns so the quilting will have to wait. My husband has his winter jacket and hat on because it is cold and the fluffy stuff is still coming down. Guess who is enjoying this photo shoot the most! Toby's paws are buried in the snow but he does not care - he is running around happy. And this is my finish for today. I am linking to Crazy Mom Quilts so head over to check out other Friday finishes. But, before you go, I heard that Craftsy has 50% off all quilt, knit, crochet kits and supplies until February 25th. For cake decorating supplies, the sale is 40% off. Wow! Pattern-writing plus online shopping - this is turning out to be a fun Friday! Thank you! I fell in love with the pattern and the possibilities!